The exhibition entitled The Written Word will open in February 2021 and comes almost exactly 5 years to the day after the opening of our first exhibition Transformation | Trawsnewid . In October of 2017 SWS Member Joan Mallett entered a WI competition to create a White Ribbon Logo for the ‘Not in my Name’ campaign. The campaign was established in 2012 to raise awareness of Violence Against Women (VAW) and to challenge the attitudes and behaviours of a minority of men who use or condone violence against women. Annually, the Campaign marks White Ribbon Day and involves WI members in awareness-raising activities and in the recruitment of male ambassadors in speaking out against VAW. The white ribbon is a symbol of men’s opposition to male violence against women and wearing a white ribbon is a personal pledge never to commit, condone or remain silent about violence against women. Joan’s entry came second in the competition and she was invited to the Senedd in Cardiff to attend the event to mark White Ribbon Day and collect a certificate from Ken Skates AM, then Cabinet Secretary for Economy and Transport. The design featured pastel to highlight the white ribbon logo and black and red gouache for the lettering. The winning entry was a set of earrings and a pendant of the white ribbon logo made from polymer clay and silver, and third place was a machine embroidery of the logo. 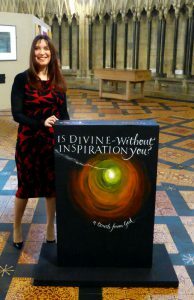 “Divine Inspiration”, the 95th Anniversary Exhibition of the Society of Scribes and Illuminators took place in York Minster from 3 – 18 September 2016. “Is Divine Inspiration within you? Or is Divine Inspiration without you? I began by considering what the words ‘Divine Inspiration’ meant to me. I quickly realised that creativity, its origin and how it manifests itself would be my starting point. When we experience that ‘light-bulb’ moment what is it that sparks it? I came up with two opposing answers. The first is that Divine Inspiration is within us – a brain synapse, the result of chemical messengers leading to the formation of strong neural pathways made stronger from years of practice and experience. The second is that Divine Inspiration is without you – a flash of inspiration which has an external source or which has no input from you – a touch from God. I began to consider how I would represent this concept and as is often the case with my work – light played a central role. 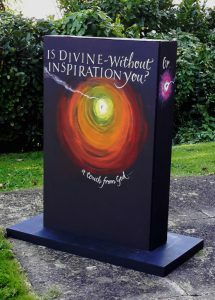 I found myself drawn to the idea that if I had light coming from the top of the box, projecting the words ‘Divine Inspiration’ it would look ethereal; people could put their hands through it yet not touch it. My next challenge was how to create this effect? I found the answer with motion sensor lights.